So as the country shivered, got soaked and blown to bits early last week I took the opportunity of shooting down to southern Portugal for two days and a night to test the new BMW 3-Series which arrives in showrooms here early next March. 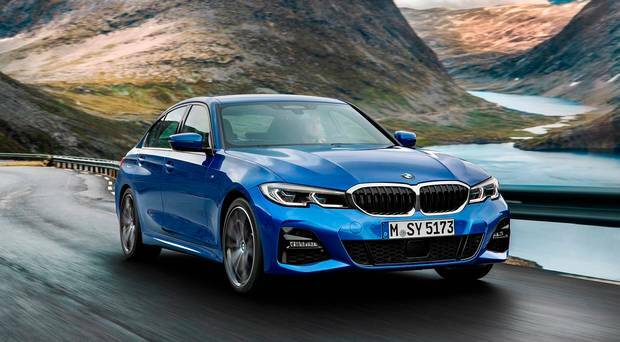 This an amazingly important car for the company, as it is not only its top seller – notching up 15,543,000 sales since its launch in 1975, and makes up one-in-five cars sold by BMW – but it reinforces the company’s credibility for driving dynamics as well as showing a continuing commitment to the saloon concept, as crossovers and SUVs turn the world’s head. I have long loved the 3-Series for the sheer joy of driving it, although it went through a period when it was too tight in the back to happily function as a family car. It was also a car with which I associated Aengus Fanning, the much respected but impressively eccentric editor of this paper from 1984 until his death, nearly seven years ago. I first started working on the paper during his first year, and next year will celebrate half my life here. Aengus’s driving had a capricious, devil-may-care attitude about it, as frequent small scrapes and many parking tickets attested. He also had a total disregard for the bus-lane system. This I discovered nearly to my cost, when many years ago I had to move my bike quickly out of the way as he whizzed past in his 3-Series convertible, oblivious to any speed or lane restriction. As the car passed, I saw that four people of a darker hue than the Kerry-raised editor, who swam every day in the sea, were squeezed in with Aengus. It was easy to work out that they were off to play as “ringers” with the Sunday Independent cricket team, for which Aengus would scour groups of people over here from the Indian subcontinent for what he perceived as their natural cricket talent. I had good thoughts of Aengus and his love of his car and sport when attending the international launch of the new BMW 3-Series, which is built on a brand-new platform. It was then and still is a car that brings joy to you with its looks and the dynamics that the engineers have, over successive generations, put into the car. For embargo reasons I am not able to speak of the driving abilities of the car for another 10 days, when my colleagues on daily papers will have the drop on us. While BMW have always staked a lot on saying that the rear-wheel drive experience gives the real beauty of being at the wheel of a powerful thoroughbred machine, gradually the move to all-wheel drive and next year FWD for the One Series is maybe beginning to chip away at this certainty. But, for the moment, it was impressive to attend workshops at the Portimao Racetrack where engineers could demonstrate the work they are putting into refining suspensions and engines to deliver another lot of thrills for the 3-Series. Normally this would put me to sleep, but here, with the sounds of carts whizzing around the track in the background, I could sense the passion of the engineers. The excellent vehicle genes of the new car have been developed by a perfectly balanced weight distribution of 50/50 front and rear, an overall lighter body, wider track width and lower centre of gravity and stiffer chassis. It all aims to make the car more agile while keeping comfort at a premium. I’ll tell you if they succeeded on December 16. In addition to the aim of making the new 3-Series the “best driving sports sedan” with the mix of weight reduction and improved aerodynamics, BMW had other presentations and listening to Stephan Horn, Head of Product Management BMW 3-Series for the last five years over dinner, you could tell that they wanted, with some justification, you to believe that buying the car “was a beautiful high value decision”. It would be bigger all round, have extra legroom, be cleaner, more economical, be a bit cheaper, have better acoustics and, most importantly, would make customers’ life easier for them. It was this last part which was the focus of the launch, but other than the excellence and clarity of the presentation, it leaves me with slightly iffy feelings. The whole point is to make the car, say BMW, an extension and very integral part of your life, so that it can become your office or an extension of your home from which you can make conference calls; receive and answer mail; find the nearest coffee shop; have music and climate to suit your mood and level of tiredness, and do it all without taking your finger off the steering wheel, which, with its own certain level of autonomy, is driving you and keeping you in lane and at the right distance in traffic. You do this by addressing the car, “Hey, BMW” or “Ziggy” or something, and give your commands. When addressed by the impressive Tanja Klossek from BMW, the Intelligent Personal Assistant feature worked fine, out on the road, when the Offaly burr of my co-driver, the now master storyteller Eddie Cunningham*, and my own perceived West-Brit tones mingled in talking to the system, it was less successful, but I am sure that it would be rectified quickly when you actually owned the car. However, I am left to wonder whether we are just having far too many distractions in the car. When autonomous driving completely comes that’s all well and good but when you are still sending a killing machine at massive speeds down country roads, when a well-oiled pedestrian might suddenly step out, it’s a different matter entirely. The best safety systems in the world cannot take the responsibility away from an alert, not distracted, driver. Prices for the seventh generation 3-Series start at €43,700 for a 318d SE model, and the 320D SE Model is a little over €46k and includes the 1pc diesel surcharge. The company announced recently, that from the beginning of last month, it was cutting its Irish list prices by an average of 5.1pc across its range. Once bitten by the 3-Series bug, drivers are often in love for life, even if they might move up the BMW range. The company sees a future in diesel, although they do think that petrol sales will be good and an electrifying plug-in hybrid mode is coming fast. As I packed a small case to go to Portugal, I found a bag tag BMW had given me for the launch of the last BMW 3-Series – sweet memories – and even further back, I remember writing of the launch of the M3 nearly 18 years ago, when a Dane mumbled to me in the early hours of the morning that driving it was like the thrill of “the first espresso of the morning, a bottle of premium champagne, or finding your girlfriend is a real blonde”. That was the sort of thing you could say then. I came back last Tuesday night having seen a wonderful car with a much more intrepid look. It’s a shame my driving impressions have to stay silent for two weeks. On the flight home, I finished Sally Rooney’s wonderful novel Normal People just as she was being announced as the winner of the Novel of the Year at the Irish Book Awards. As I closed the book, my eyes were brimming with tears and, with the dregs of my Hendrick’s and tonic, I toasted Ms Rooney, the new BMW 3-Series and a perfect trip that we are very privileged at times to do. The BMW 3-Series is a thing of beauty. I shut my eyes and see Aengus flying down the road. He, like generations before and after him, got a thrill from the car.